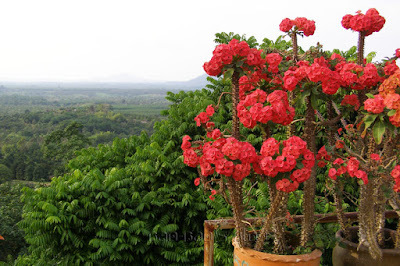 It's called Euphorbia milii or Crown-of-Thorns plant. In Lao it's called dok saetee. Many people would find that the thorns would make it a difficult plant to keep. Nevertheless, Lao people appreciate this prickly yet pretty plant. In Laos, this plant is typically grown in pots or as a hedge around the house. Locals often describe it as one of the must have plants for any household. And it is said to protects the home and no doubt it probably does with all the prickly thorns that it's covered with and when used as a natural perimeter fence. If it blooms, then this is said to be a sign of a good home, so they say. Its blooms are often red or pink with green foliage. Its sap and roots release a very sticky residue. So if you're growing it in pots you'll definitely want to protect whatever flooring you have it sitting on, whether inside or outside.